I am sure there are many others that are fascinating there. It is always interesting to me to see what people were thinking about in terms of microbes in the past. And Google Books is one heck of a convenient way to do this. Nice little press release/story for bacteria and ecology lovers out there: 'Rare' bacteria in the ocean ain't necessarily so, researchers report. This is about work by some colleague of mine including in particular Barbara Campbell at the University of Delaware. I worked with her on a genome project a few years ago (of a bacteria found on the surfaces of some deep sea worms - see Adaptations to submarine hydrothermal environments exemplified ....). Alas, the new paper, in PNAS is not Open Access but the story covers it reasonably well. Here are some notes from my recent trip to Woods Hole, MA where I went to give a talk for the Marine Biological Lab "Microbial Diversity Course". Anyone out there recommend best way to get from Logon to Woods Hole after 10:30 PM (no Peter Pan bus) w/o renting car? Woke up at the Swope Dorms and, thanks to the lovely reception I got from the Housing Staff (see A squatter's journey to the Marine Biological Lab (MBL) again for more detail) I was not very happy. I went in to town to get a latte and something to eat and then made it over to the Microbial Diversity Course to hear a few talks and see some of the folks there. Then I went back to my dorm room, packed up my stuff and abandoned Swope and went to the Sleepy Hollow Motor Inn just up the road, a bit out of town. I had already called and they held a room for me (I tried the one place actually in town but they were full). So I checked in, dumped my stuff and then walked back in to town. I eventually ended up going to dinner with some of the course TAs and other personnel. "Chefs across the globe may not know it yet, but their baker's yeast just left the kitchen and blasted off into low Earth orbit". Sure - NASA has had some issues with their press released in the recent past. But I like this one. Funny. Interesting. And the science seems, well, worth doing. They are putting the yeast deletion constructs into orbit --- and they are going to use them to study what genes might be involved in survival in microgravity. Sure the connections they try to make to humans are a big big stretch (though I love the "yeastnaut" term), but that didn't bother me for some reason - maybe since it is done in a light hearted way. Hat tip to Corey Nislow, one of the researchers behind the Yeast in Space project, for pointing me to this story. Just found this in an old folder on a different topic. 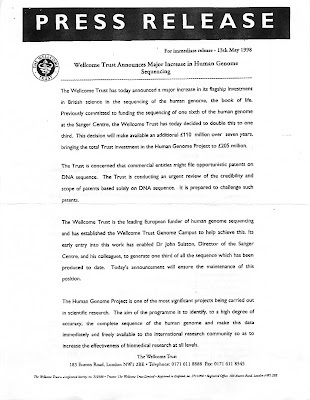 It is a press release from the Wellcome Trust that was handed out at the Cold Spring Harbor Genomes Meeting in 1998 in response to the announcement from Venter et al. that they were starting a company to sequence the human genome. PubMed Central (PMC) is a free archive of biomedical and life sciences journal literature at the U.S. National Institutes of Health's National Library of Medicine (NIH/NLM). In keeping with NLM’s legislative mandate to collect and preserve the biomedical literature, PMC serves as a digital counterpart to NLM’s extensive print journal collection. Launched in February 2000, PMC was developed and is managed by NLM’s National Center for Biotechnology Information (NCBI). It is a fantastic resource. Alas, there is one major limitation. Mostly it is an archive of papers submitted by publishers. Some publishers do not submit their material there. Fortunately, there is now a way around this. Author's can submit their own papers to PMC. However, there is some caveats to this -- there are severe restrictions on what one can submit. 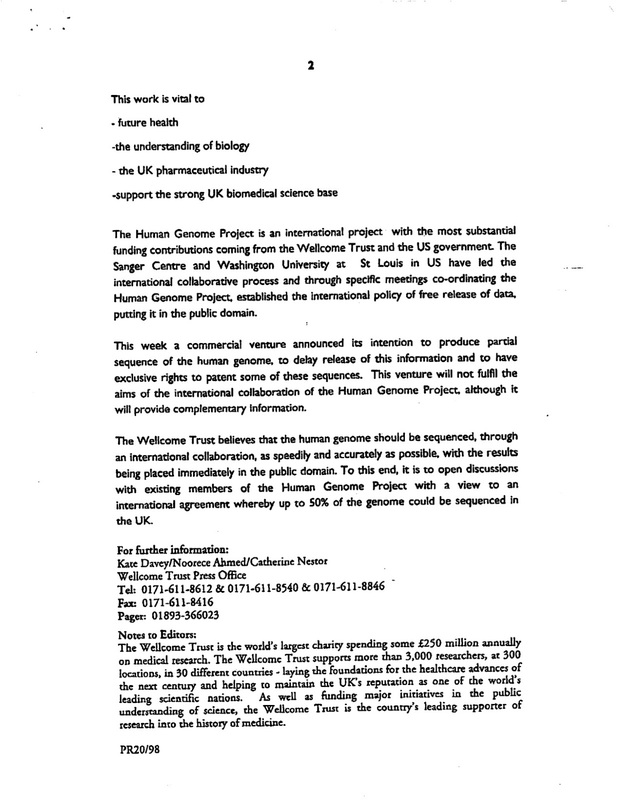 In the past I was aware of one of these caveats - the work in the manuscript has to have been at least partially supported by NIH funds (well, there is a way to submit if supported by the Wellcome Trust to). To submit NIH supported work, you have to use the NIH manuscript submission system. 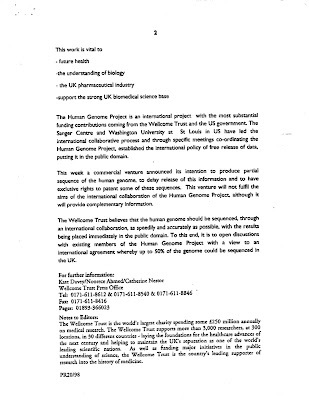 Why they won't take papers supported by other funding agencies I do not know. Imagine if Genbank only took sequences inferred with NIH funds? Imagine if libraries only took books supported by rich Europeans. I am sure Pubmed does this because other agencies don't pay for the archive but still --- I think this is shortsighted. Your submission to the NIHMS system cannot be processed because the NIH Public Access Policy does not apply to this material. The NIH Public Access Policy does not apply to book chapters, editorials, letters, or conference proceedings. As such, we are sorry that we cannot process your submission. And though my paper was not one of these things, it is marked in such a way that it seems to be an editorial. And thus apparently they won't take it. I find this a bit surprising since PMC is actually filled with things like editorials including ones by me like PLoS Biology 2.0 and Genomics of Emerging Infectious Disease: A PLoS Collection and meeting reports like Meeting Report: The Terabase Metagenomics Workshop and the Vision of an Earth Microbiome Project. and letters (none of mine but I found many of others including even responses to letters to the editor). I have run this through my brain over and over and I cannot figure out why (or in fact how) they would exclude these types of materials. I am going to ask around and see if anyone knows more detail about this but I am not convinced there will be a simple explanation. Most likely it will have something to do with trying to cover "research" but not opinion. But in my opinion, research and opinion are not always distinct. Well, I have arrived at the Marine Biological Lab in Woods Hole after a pretty disastrous journal. I am here to talk in a Symposium that is part of the "Microbial Diversity" summer course: Microbial Diversity - Mbl.edu. I am hoping all goes better in the next few days than it did yesterday. I flew from Sacramento to Minneapolis and the plane arrived early. Then we sat on the runway for 30 or so minutes because first, we did not have an open gate to go to and then second, because the gate staff could not get the walkway to connect to our plane. Then I thought I was going to barely make my connection to Boston. Alas, my flight to Boston was delayed due to engine trouble. I discovered via twitter than some others were also stuck waiting for Delta to fix their planes. Finally, we boarded and then we sat in the plan for an extra 20 minutes to load luggage and cargo. Finally I got to Boston - about an hour late - and got picked up by a nice Prius from GoGreenShuttle (thanks Julie Huber for the suggestion) and got to Woods Hole at about 1:30 AM. I called Lizzie Wilbanks, a Phd student in my lab who is one of the TAs for the course this summer, and she came down with what were supposed to be my keys to one of the dorm rooms in Swope Hall. She went back to her room and I went to open mine. Alas, the key did not work. It was late and I kept trying to get it to work, when a very unhappy woman opened the door and said, in essence "WTF?" I said, well, this is supposed to be my room. And she said basically "I don't think so" and shut the door. Fun.